chipKIT Digilent uC32 (or Uno32) and Raspberry Pi are both pretty cheap, almost of the same size, and although they look similar, they are different. 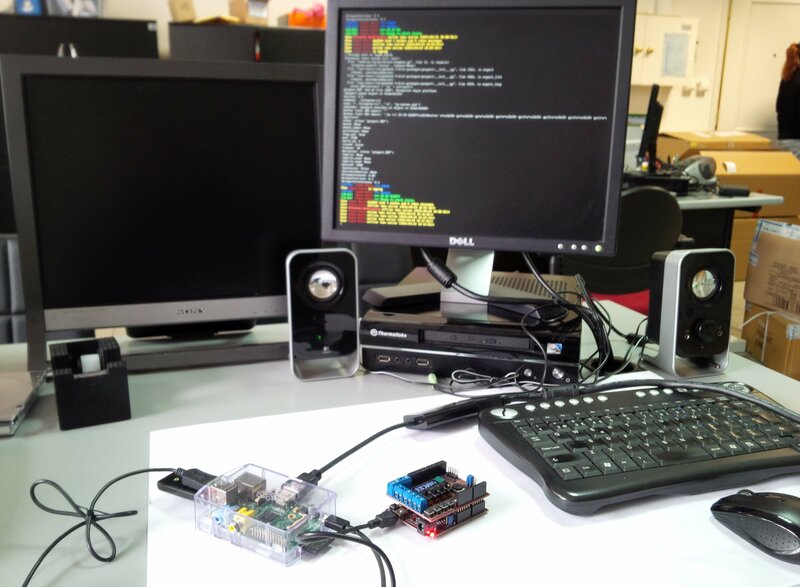 The Raspberry Pi is effectively a mini-computer, running a Linux operating system (OS), and the chipKIT is a microcontroller, without a typical typical OS, but purpose-built with important features such as EEPROM, analog inputs and PWM outputs, features that Raspberry Pi does not have. 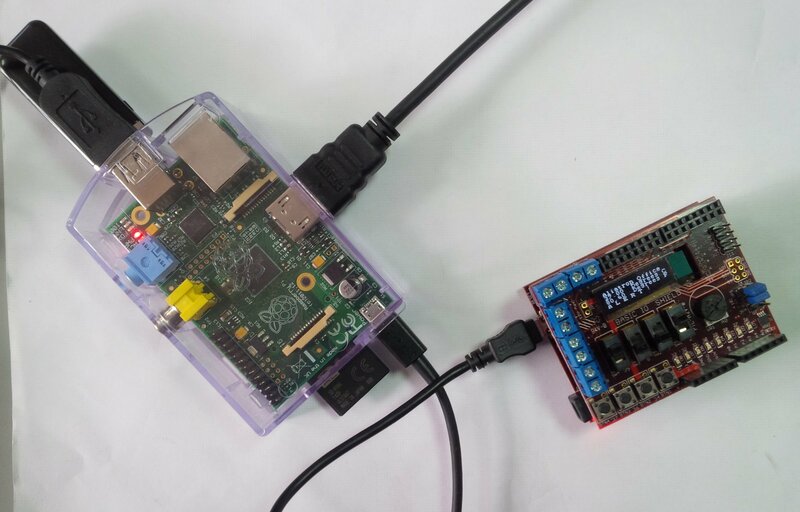 On other hand, Raspberry Pi offers Ethernet connection, USB Master, video and audio outputs, all of these that are not available on chipKIT, can enhance any electronic project. 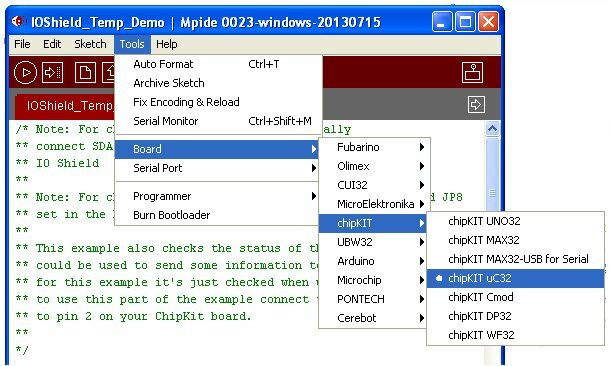 There is already a marriage between chipKIT and Raspberry Pi, called chipKIT Pi that makes it easy to connect Raspberry Pi to chipIT. The chipKIT Pi board fits nicely on the Raspberry Pi interfacing directly on the IO header of the Raspberry Pi. The board can be used without Raspberry Pi, in stand-alone mode and for this reason there is a DC plug, useful to power the board with a power supply. The ICSP header (JP3) has been added to program the on-board microcontroller PIC32MX250F128B using a Microchip PICkit or a ICD in-circuit debugger/programmer. On uC32 you must have Jumpers JP6 and JP8 set in the RG3 and RG2 positions. Install the Basic I/O shield on top of UNO32 as shown on the above image . 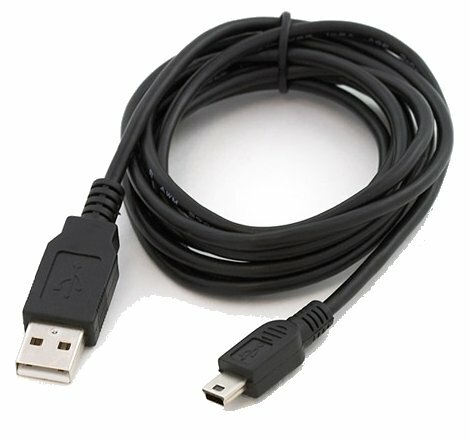 Connect to the PC with USB cable. Although USB connection will power uC32 and the Basic I/O shield simultaneously, we will use external power supply to uC32 board. 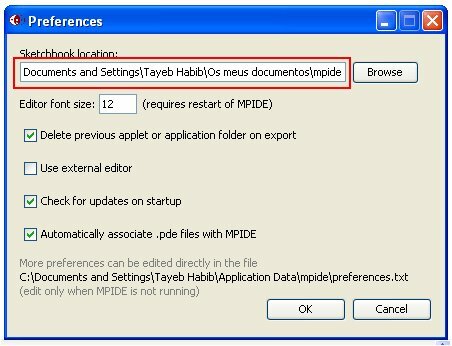 We assume that you have already installed MPIDE environment. Take note of the location of your sketches (MPIDE codes are called “sketches”). In your Windows navigate to where the folder is, and create a directory named ‘Libraries’. And choose Serial Port to which the board is connected in Tools >> Serial Port >> (port where UC32 is connected). In my case it is COM30. Now we are ready to upload the sketch to the board. Click the Upload button on MPIDE environment. We are now ready to check what is being sent to our COM30 port (your PC’s may be other) in Tools >> Serial Monitor. 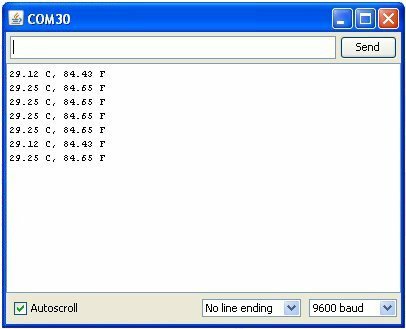 A new window will pop up showing the readings sent to your PC’s serial port: We are getting readings in degrees C and degrees F. Note that Alarm is not displayed even though the temperature is above 24ºC as set in our sketch (you can check – it is clearly written). This happens because in uC32 and Uno32 boards you need to toggle to top the rightmost switch on Basic I/O shield If you do so, ALERT will sent to serial port. You can use the switch to switch off the Alarm by toggling down the switch. If you are here, the rest will go smoothly. We will now change this sketch, and adapt it to Raspberry Pi to be read easily by Python. Also, we will add code to show the temperature on OLED display of Basic I/O shield. //high until the temp drops below 75.2F (24C). // Convert the result to Fahrenheit. Note that rightmost switch is toggled to up position. Only in this position the Alert for temperature above 24ºC will work. Now we are ready for Raspberry Pi! 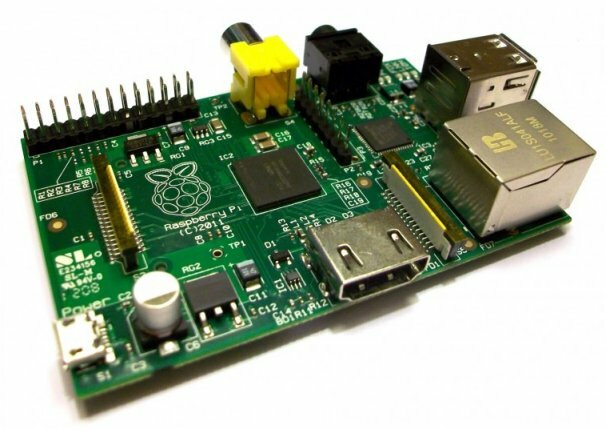 As a requirement your Raspberry Pi must have an already working Raspbian OS, and mouse and keyboard duly configured, and with network connection to Internet duly installed. If not, you need to do all those things before proceeding. The aim of this tutorial is not to install OS in Raspberry Pi or to connect peripherals to this board. After duly installing we are ready to connect our setup of chipKIT Digilent uC32 board and Basic I/O shield with USB to mini-B cable to Raspberry Pi! But, do not connect yet! I have an USB hub. where all my USB connections are made. I also have installed a TP-Link wireless dongle. Now connect chipKIT Digilent uC32 board to Raspberry Pi board with USB cable. Our chipKIT Digilent uC32 is recognized as having a FTDI serial IC. The last bit is what interests us. We have identified our recent connection as ttyUSB0 (it can be 1 or 2 or whatever is your setup). We will use this information for next part of our Procedure. 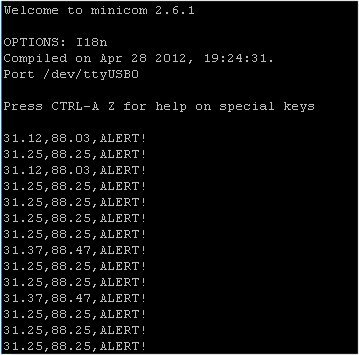 Alert is shown because we have this feature enabled and our temperature is over 24ºC threshold defined in our chipKIT Digilent uC32 firmware. The starting point of installing Telegram is the vysheng github project which contains also installation instructions. The recursive call is because two sub-projects tgl and tl-parser are also required. The && cd tg means that you end up in the tg directory ready for the next phase. Before doing anything else we will make sure you we have enough /tmp for the compilation, by enlarging /tmp. The “size=100m” and similar other parameters force the RAM size used for the corresponding temporary file to certain megabytes. The “m” suffix corresponds to “mega bytes”. Make sure you are in /home/pi/tg directory. We make a build directory in order not to clutter the source code with intermediate object files. Compilation takes a while, but eventually you will be greeted hopefully with a successful installation. Telegram is based on (free) accounts associating a user name and a mobile phone number. In order to set things up you really need access to TWO phone numbers, although thereafter you only need ONE mobile phone to use it. It is advisable to set up the Raspberry Pi to use the other mobile phone number that you will not be using. This second phone is only really needed to authenticate the account. I actually did all the set up in Raspberry Pi. Initially we can test telegram from the inside the folder /home/pi/build/bin. We will move later the binary files elsewhere so that they are easier to access and use. You should see some information printed about telegram, ending with a > prompt on the screen. Press the “Enter” key a couple of times, and wait. Note, we will need access to the mobile phone in order to get a 5 digits authentication code. After a pause, we should get a SMS on the mobile phone we have just registered containing a 5 digits code number. Alternatively if you don’t receive the code it can ring you 2 minutes later and give you the code with an automatic voice. Type this number into the Pi terminal and press “Enter”, to authenticate it. Now we need to install Telegram in our own phone. I have installed “Unofficial IM App for Telegram” in my BlackBerry BB10 from Blackberry World. Apple Store and Google Play have official Telegram apps that you can download and install in your phone. The first time we start Telegram in our phone we must enter the phone number, including land code (for example Portugal is +351). Substitute <Name_Lastname> with the names you have just registered not forgetting that you need to use _ underscore between the first and last name. You should get a message in your phone’s Telegram app. You can add the phone number you have used to register Telegram in your Raspberry Pi and then test sending a message. 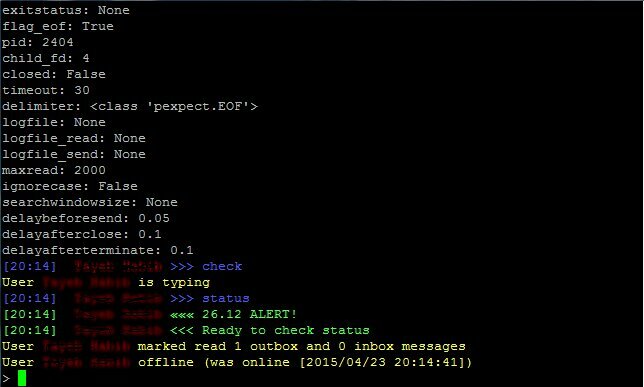 The Terminal of your Raspberry Pi as well as your phone’s App will show the messages. We will now write a Python program for reading from USB port, and accepting commands from Telegram. Now in /home/pi/tg/build/bin directory of your Raspberry Pi, write the following code, and name it tempmon.py. You can use the default nano editor. 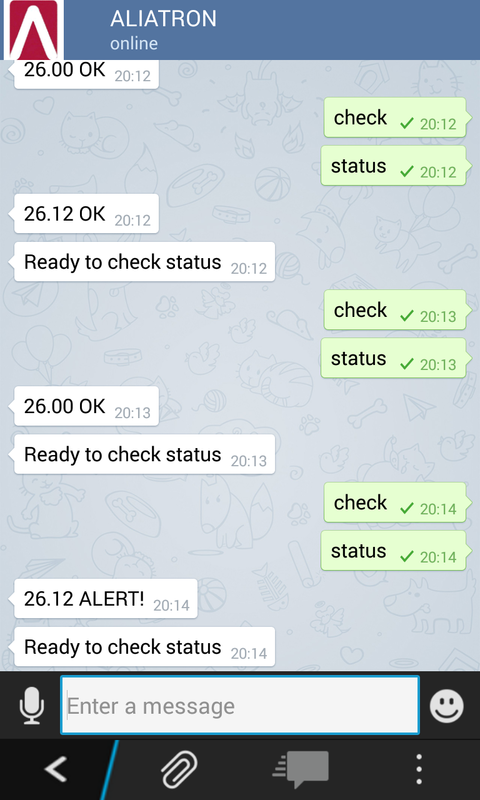 In your phone’s Telegram app you will see 26.0 OK or whatever temperature is read in ºC and if it is OK or there’s an ALERT. NOTE: I am enabling ALERT with rightmost switch on Basic I/O shield in top position. We will modify test.lua script. We can try a couple of the procedures already built into it. 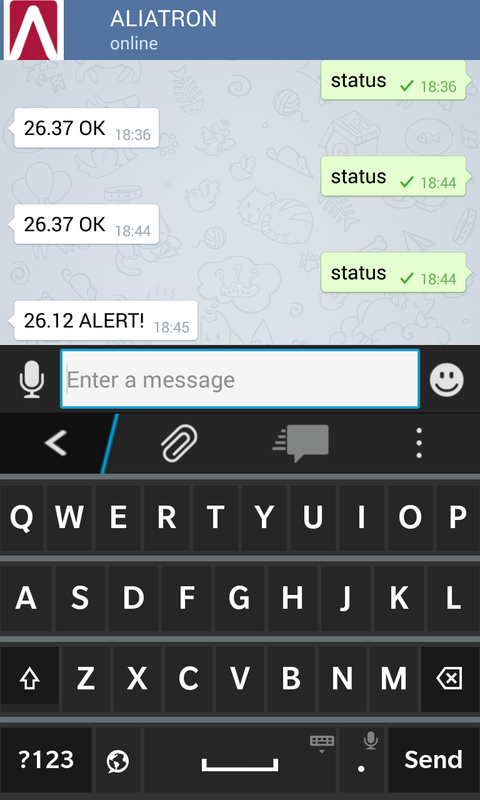 From your phone’s Telegram app send the message ping to your Raspberry Pi. Save <strong>tempmon.lua</strong> and we are now ready to test our set up. Raspberry Pi will reply with temperature and if everything is OK or there is an Alert! 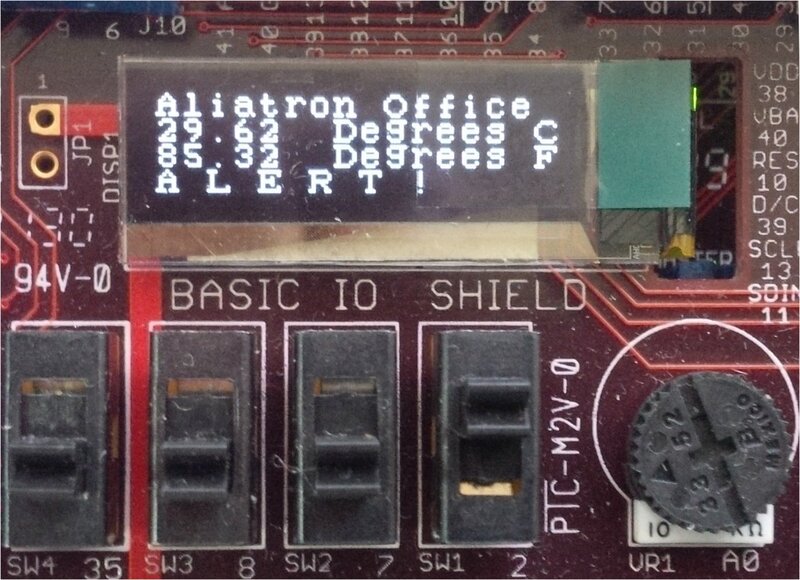 ALERT is enabled by putting in UP position the righmost switch on Basic I/O shield. In fact imagination and resources are the limit. We can add a camera that will send us snapshots of our control process, we can control equipment and devices and receive feedback from them, and much more. 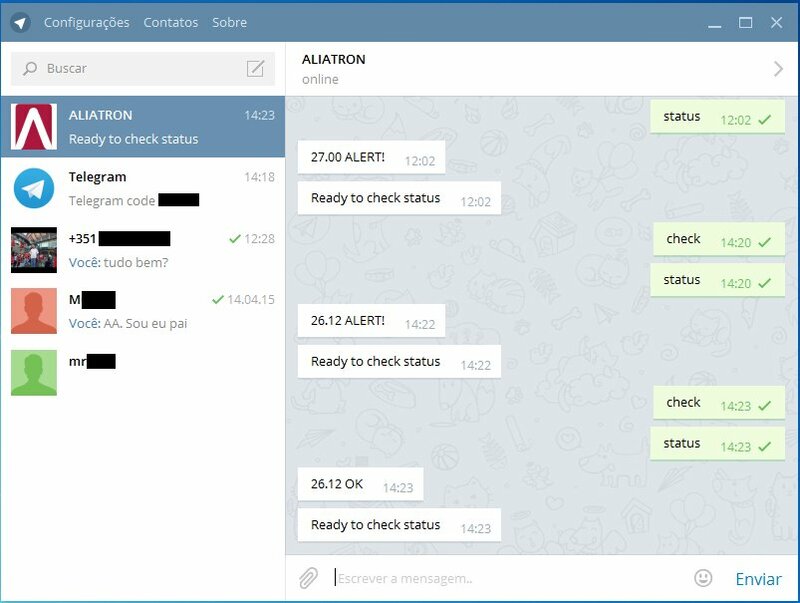 In fact IM (Instant Message) apps such as Telegram can add a whole new dimension to Automation, provided security issues are addressed. A special thank you is due to Robin Newman for his excellent tutorial at https://rbnrpi.wordpress.com. Everything Robin Newman wrote worked, and his post was an inspiration for this one I have just written. A thank you is also due to Geeky Theory and their execellent website for the tutorial of Pexpect. I had difficulties in compiling Lua, and could only sort it out after increasing the size of /tmp directory. A special thank you is due to Darmawan Salihun for his simple explanations. Connecting up Raspberry Pi with a board such as chipKIT Digilent uC32 opens up a whole new range of interesting electronic projects. 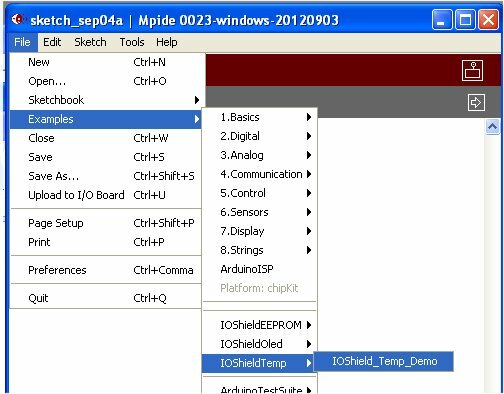 Microchip has already made it easy with chipKIT Pi, as mentioned at the beginning of this tutorial. Raspberry Pi offers lots of interesting and powerful solutions at low price, that can be combined with another low-priced board yet equally interesting and powerful chipKIT Digilent uC32. 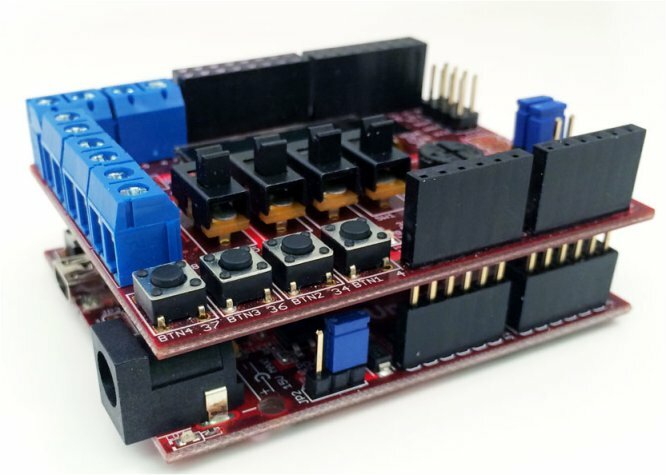 Digilent Basic I/O shield, that also offers more interesting electronic projects and proof of concept, with very same idea of connecting up with Raspberry Pi. This entry was posted in Electronic Projects and tagged Arduino, BASIC I/O, chipKIT, Digilent, Instant Messages, LUA, Pexpect, PIC32MX, Python, Raspberry Pi, Remote Control, RPi, Script, TCN75A, Telegram, Temperature, uc32, WhatsUp. Bookmark the permalink.